This has been a busy few weeks and only the second time I have physically posted anything on the website and it is a very rewarding and exciting experience. As I wrote in the welcome message to readers last month, for many years we have been blessed to have Jim McCool as our editor and now we are flying solo and I can testify that it feels great when your own post appears on the web page. I guess the gloss will wear off eventually but for now it feels good to be in the future at last. The first piece I posted a couple of weeks ago is entitled ‘Back in the World’ and is a story from our trip to Aughrim in June. 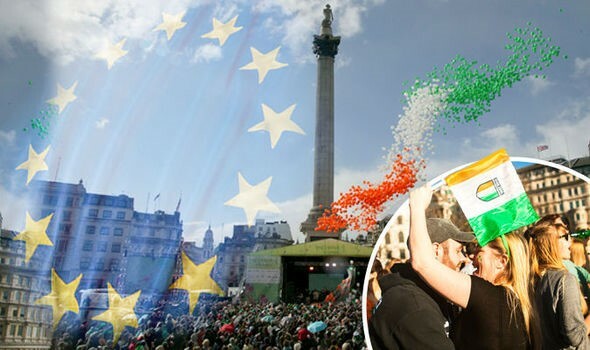 This was the latest in our series of ‘dry’ trips where we take people who have problems with alcohol and who have been helped by John Glynn and the Kairos Community Trust, to go back to Ireland sober. This can be a big deal for the many who feel that they have let down people at home and who had either stayed away unable to face their families and friends when things didn’t work or felt the need to be drunk in order to face their families when they did come home. The process often starts on the boat or on the boat train and these are triggers we know only too well but we also know that they can be faced with the help and support of a group. I nicked the title from a Curtis Mayfield song about soldiers returning from Vietnam meeting their families for the first time after the horrors they had witnessed and it struck me as appropriate because in many ways these recovering drinkers are back in the word again after so long away and it is a chance to start afresh. This was certainly the case for some of the people on this trip and for some on every trip we do. 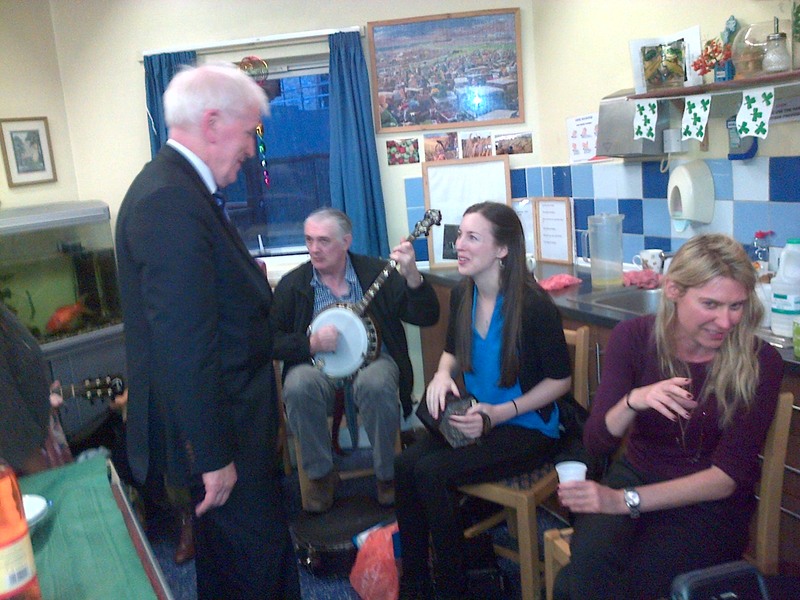 This month we got to meet Jimmy Deenihan (seen above with Caroline, Irish musician and Aisling volunteer) the Irish Minister for the Diaspora at a St. Mungo’s hostel in Chichester Rd in Kilburn. We felt the minister would need to meet some of Aisling’s clients in order to get an understanding of the work that we do and Chichester Rd is one of those places where after only a few minutes Mr Deenihan was chatting with older Irish men and women in an informal gathering in their own home. The hostel did us proud and put on some Irish music and a buffet of Irish snacks (red lemonade, Cidona, Kimberley and, Mikado etc.) During the visit the minister launched our new website and discussed with us our plans for the future of Aisling. Our main target for the coming year is to get the key to the door of our very own Aisling Resettlement Centre during our 21st year. This has been a long held dream of Aisling and it looks like we have now taken a step nearer. Mr. Deenihan listened to our plans and offered to set up a meeting with the relevant departments in Ireland who could take our plan forward. For years now we have been advocating a home for Aisling clients who want to return to Ireland to live where they can receive the necessary support they will need to make a transition into permanent resettlement. We have met with ministers and department heads in Environment, Social Welfare, Health and Foreign Affairs over the years and all of them have passed the buck on to another department. Minister Deenihan recognised this problem and promised to put together a round table meeting with people who could make decisions – one way or the other. The Green Tie Ball (http://www.thegreentieball.co.uk/) is a very smart fundraising event held every year by health service professionals in aid of the Irish community in London and this year it was held to raise money for Aisling at the Park Plaza Riverbank hotel on the Thames just downriver from the Houses of Parliament and the London Eye (quite near to MI5 headquarters too). It was a great night which raised much needed funds for Aisling to continue with our unique services. At the time of writing we have just successfully completed our annual Race Night at the Sheephaven Bay pub (http://www.sheephavenbaycamden.co.uk/whats-on/) in Camden Town. Our host, Pat Logue has been raising funds for Aisling for 20 years and back in the early days when he got his first late license as manager of the Oxford Arms on Camden High St, he started charging customers a £1 discretionary donation to Aisling to get into his pub after 11 o’clock. These days Pat runs one of the best bars in Camden with very loyal locals and great staff. We had a grand night, with raucous racing and boisterous betting with many friends of Aisling and the Sheephaven and we raised a lot of money, enough to pay for a whole supported trip. Pat has also secured tickets for next year’s rugby World Cup which we will be raffling over the coming months. We are also very pleased to be a favoured charity of the British Irish Trading Alliance (http://www.bita.ie/) and have attended a number of their networking events at the Rising Sun pub near St Pauls in the City (http://www.citypubs.co.uk/pubs/therisingsun.html) with Paul Whitwell the president of the alliance and tireless networker for Irish businesses and a great supporter of Aisling. We are looking forward to continuing the association with BITA into the New Year. Our next trip and our last one of 2014 is to Carlingford in Co. Louth in the North-East of Ireland which is an area we have neglected to visit since our third outing back in 1996. On that trip we stayed in the beautiful Mourne Mountains near Castlewhellan enjoying the considerable hospitality of the border people. I am looking forward to our visit to Louth and also to writing about it and posting stories about our experiences here on the website in the next instalment of Aisling’s incredible adventures.